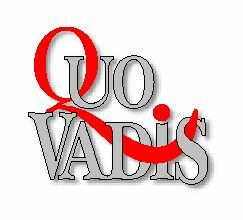 Quo Vadis ? .... Where are you going? for all Australians on which they may develop the foresight and intuition necessary for success in the constantly-changing knowledge-based Network Society of the 21st Century. With information overload, it is impossible to remain updated unless you develop a personal Network of Knowledge. The Quo Vadis Network will give you the knowledge and resources, and help you develop the strategic vision and matrix of strategic options on which to create your own future. more innovative, more perceptive, more enterprising, more creative, more visionary, more confident, more secure, more competitive, more open-minded, more adaptable, more diverse, more tolerant, more interesting, more optimistic, more happy ..... and more successful. is for Australia to become a nation with the world's highest quality of life, and a leading global citizen; where our economic, social, cultural, and natural environments will have been developed to recognise our individual independence, our mutual interdependence, our social cohesion and our cultural diversity; and a nation where all Australians have the opportunity to develop to their full potential. Groups of people who physically meet around Australia each month in local communities to discuss the future. Shaping the future of Australian Politics? Your way of keeping touch with only relevant matters and the communication medium for the Quo Vadis Futures Forum.